Home » News Retirement Transitions » Medicare Advantage » What is Part C of Medicare? 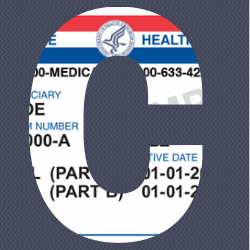 You’ve heard about Medicare Part A (Hospital Insurance), Part B (Medical Insurance), and Part D (Prescription Drug Plan), but what is Part C of Medicare? We have discussed Medicare, Medicare Part A (Hospital Insurance), Medicare Part B (Medical Insurance), Part D (Prescription Drug Plan), but what about Part C of Medicare? Part C is also called a Medicare Advantage Plan. This plan can have drug coverage included with the medical plan or have stand alone medical coverage only. Part C of Medicare (Medicare Advantage Plans) are not available in all counties in your state. When a plan applies to Medicare to offer their plans, Medicare does not mandate that the plan be in all of the counties in that state. We advise that you look at your options if Medicare Part C plans (Medicare Advantage Plans) are available in your area. If you choose this plan, you still have Medicare, you still continue to have Part A (Hospital Insurance) and Part B (Medical Insurance) and Part D ( Prescription Drug plan) may be included in your plan. So in essence Part A, Part B and Part D equals Part C of Medicare. Medicare pays the plan ( the private insurance company) a set amount of money each month for your care and the insurance company also receives the Part B premium that you pay each month which is at $121.80 ( this amount might be higher or lower depending on your income). Typically when you go for medical services you would use your Medicare card and a Medicare Supplement Insurance card. But when you join a Medicare Advantage plan, you use this card for your visits to the doctor, hospital, and if your plan includes prescriptions then you would use it at the pharmacy. The Medicare Advantage plan pays instead of Original Medicare. Medicare Advantage plans, or Part C of Medicare, have to cover all of the benefits of Original Medicare and at times some of these benefits are enhanced. They could also have additional benefits such as dental, coverage if you travel out of the United States, and fitness memberships to name a few. In conclusion, when you are shopping for your health coverage with Medicare, make sure that you get with a Representative that is certified to sell Part C and Part D of Medicare so that you can explore all of your options and find the best plan to fit you, and not what plan is best for your agent. It takes a lot of time and testing each year to be certified to bring you these plans, ask your agent if they are a well-rounded certified agent to show you all of your options. We at Retirement Transitions are trained, licensed, and certified to sell all types of plans that are in your best interest and not ours.